Most Christians live in the world submerged in earthly realities and temporal occupations. Is this only a fact, an event that governs their Christian lives, limiting their real possibilities of development? Can one be both fully Christian and engaged in the realities of the world? How can the requirements and duties of family, professional, political, and social life be harmonized with the call of the faithful to sanctity? 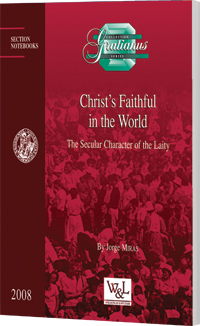 In Christ's Faithful in the World: The Secular Character of the Laity, Professor Jorge Miras shows that being in the world is not an accidental fact but the laity's proper way to assume the Christian vocation to sanctity and apostolate.